Giddy up! Cabo Wabo Cantina will welcome the Wrangler National Finals Rodeo (NFR) with live music and drink specials from Thursday, Dec. 3 to Saturday, Dec. 12. Live music acts will include acoustic performances from The Ryan Whyte Maloney Trio, Shawn Eiferman and Rein Garcia. Guests may also enjoy buckets of Dos Equis beers, priced at $21; shot specials, priced starting at $5; and signature cocktails including the VOJITO, a flavorful blend of Devotion Black and Blue vodka, fresh berries, fresh mint and lime juice, priced at $13. Guests may fuel up for long days at the rodeo with Cabo Wabo’s breakfast selections including the croissant French toast, a freshly-baked croissant classically prepared into French toast, topped with warm maple syrup, fresh berries, powdered sugar and whipped cream, priced at $10.95; and the CW eggs Benedict, made with layers of machaca, chorizo and poached eggs on an English muffin, topped with melted pepper-jack cheese and hollandaise, priced at $13.95. Bottomless mimosas and bellinis are also available for $24.99. Breakfast is served daily from 8 to 11 a.m.
Cabo Wabo Cantina will celebrate the holiday season with two signature cocktails, offered from now through Sunday, Jan. 31. Cabo Wabo will introduce the Red Nose Rocker, a flavorful combination of Espolón tequila, Amaretto, cranberry juice, vanilla, cinnamon and nutmeg; and the Mistletoe, a seasonal blend of Skky Cranberry, Midori, apple cider and citrus, each priced at $13. Guests may pair either of these cocktails with regular menu items including the New York Ranchero, made with chipotle-marinated New York steak, grilled onion, pico de gallo, papas and chorizo, priced at $32.45. It’s time to feast and fiesta at Cabo Wabo Cantina with the introduction of the turkey tamale in honor of the Thanksgiving holiday. Available from now through Monday, Nov. 30, the turkey tamale is filled with succulent turkey meat and topped with a house-made mole sauce and fresh cranberry salsa, priced at $19.95. Cabo Wabo’s regular menu items will also be available for purchase including carne asada tacos, made with grilled steak, salsa arbol, topped with avocado, cilantro and onions, priced at $15.95; and short rib enchiladas, made with slow-cooked, hand-shredded beef, fire-roasted tomato sauce and topped with a delicious house cheese blend, priced at $16.95. Cabo Wabo Cantina will honor Veterans Day with a two-for-one drink special on Wednesday, Nov. 11. Cabo Wabo will invite all veterans and active-duty service members with a valid military ID to double up on their favorite cocktails for the price of one. Selections include Cabo Wabo’s signature Vojito, handcrafted with Devotion Black and Blue vodka, fresh berries, fresh mint and lime juice, priced at $13; and the Cocorita, made with Cabo Wabo Blanco tequila, lime juice, crème of coconut, served on the rocks and rimmed with freshly toasted coconut, priced at $14. Some restrictions may apply. Cabo Wabo honors veterans and active-duty service members throughout the year with a 20 percent discount off the total dining bill, available daily. Cabo Wabo Cantina will honor National Nachos Day with signature nacho dishes on Friday, Nov. 6. The strip-side cantina will celebrate with the Nacho Platter, a plate of crunchy tortilla chips loaded with a house cheese blend, refried beans, jalapeño, cotija, pico de gallo, sour cream and guacamole, priced at $14.95. For a heartier helping, guests may add grilled chicken for an additional $3; carne asada for an additional $4; or grilled shrimp for an additional $6. It’s time for boos and booze! Cabo Wabo Cantina will celebrate Halloween and Dia de los Muertos with live music and the ultimate party potion from Friday, Oct. 30, to Sunday, Nov. 1. Cabo Wabo will serve the Widow Maker cocktail, a blood-red drink handcrafted with Crown Royal, Peach Schnapps, cranberry and Jäegermeister, priced at $12. Award-winning singer and songwriter, Shawn Eiferman, will also perform on the Strip-side patio on Saturday, Oct. 31. The cantina’s signature cocktails will also be available for purchase including the CW Mai Tai, blended with Sammy’s Beach Bar rum, Captain Morgan, Orgeat, orange Curacao, tropical juices, grenadine and topped with a float of Myer’s rum, priced at $14; and the Cabo Rockin’ Iced Tea, crafted with sweet tea vodka, lemonade, fresh mint leaves and served on the rocks, priced at $14. It’s time to taco ‘bout a celebration at Cabo Wabo Cantina! The Strip-side cantina will celebrate National Taco Day with a street-style taco cart on the patio on Sunday, Oct. 4. Cabo Wabo’s made-to-order taco selections include chicken, beef, pork and al pastor rotisserie street tacos; topped with lettuce, cilantro, onion and avocado, priced at $3 each. Signature cocktails and menu items will also be available for purchase including the Vojito, a blend of Devotion Black and Blue vodka, fresh berries, fresh mint and lime juice, priced at $13; the Mango Picante margarita, handcrafted with jalapeños, mangos, Cabo Wabo blanco tequila, triple sec and sweet and sour; and the Cocorita, made with Cabo Wabo blanco tequila, lime juice and crème of coconut, each priced at $14. Drink for a cure! Cabo Wabo Cantina will honor National Breast Cancer Awareness Month by donating a portion of the proceeds from each Vojito cocktail purchase to Susan G. Komen of Southern Nevada throughout the month of October. Cabo Wabo’s original Vojito is handcrafted with Devotion Black and Blue vodka, fresh berries, fresh mint and lime juice, priced at $13. From Wednesday, Oct. 1, through Friday, Oct. 31, Cabo Wabo will donate $1 from each sale to Susan G. Komen of Southern Nevada, a nonprofit organization dedicated to raising funds to provide breast health education, screening and treatment services to medically underserved women in the area. Guests who purchase the Vojito during October will also receive a complimentary pink rubber wristband. Cabo Wabo Cantina will host action-packed viewing parties for upcoming Ultimate Fighting Championship (UFC) fights. The Strip-side party destination will serve as an ultimate fighting headquarters for UFC 192 on Saturday, Oct. 3. The championship bouts will be shown in Cabo Wabo’s private upstairs lounge, The LOFT, on numerous flat-panel big-screen TVs, including a 184-inch video grid, a 180-inch projection screen and two 80-inch high-definition TVs. For an admission fee starting at $30 per person, guests will take in the Pay-Per-View fights while enjoying panoramic views of the Strip, beer bucket specials, signature cocktails and a full list of menu items available for purchase. ¡Viva Mexico! Cabo Wabo Cantina will offer an authentic dish to celebrate Mexican Independence Day from Monday, Sept. 14, through Sunday, Sept. 20. Executive Chef Tacho Kneeland will offer chiles en nogada, an authentic Mexican dish, made with poblano chilis; filled with pork loin, fresh garlic, plantain and almonds; topped with a creamy walnut sauce; and garnished with fresh pomegranate seeds and flat parsley leaves, priced at $16.95. Cabo Wabo’s regular menu items will also be available for purchase including carne asada tacos, made with grilled steak, salsa arbol, topped with avocado, cilantro and onions, priced at $15.95; and short rib enchiladas, made with shredded beef, fire-roasted tomato sauce and topped with a delicious house cheese blend, priced at $16.95. It’s time for a tailgate! Cabo Wabo Cantina will welcome the 2015 football season by transforming The LOFT into “Football Central” during regular season NFL games and select NCAA games beginning Saturday, Sept. 12. Fans will cheer on their favorite NFL teams every Sunday on numerous flat-panel big-screen TVs, including a 200-inch video grid, a 200-inch projection screen, two 80-inch high-definition TVs and 25 high-definition TVs throughout the cantina. Drink specials will include $21 Dos Equis beer buckets and daily shot specials. 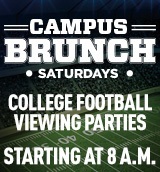 Cabo Wabo Cantina will also host Campus Brunch on Saturdays during select college games from 8 to 11 a.m. Menu selections include the breakfast quesadilla, a delicious combination of scrambled eggs, bacon, avocado, pico de gallo and cheddar and jack cheese served in a flour tortilla, priced at $11.95; the croissant French toast, a freshly-baked croissant classically prepared into French toast, topped with warm maple syrup, fresh berries, powdered sugar and whipped cream, priced at $10.95; and bottomless mimosas or Bellinis, priced at $24.99 per person. What happens at Cabo, stays at Cabo! Cabo Wabo Cantina will celebrate Labor Day weekend with live music, patio parties and a hangover breakfast from Friday, Sept. 4, through Monday, Sept. 7. Patio parties will feature guest sets from surprise DJs and drink specials including daily shot specials and Dos Equis beer buckets, priced at $21. Cabo Wabo’s signature cocktails include the Peach Sweet Tea, handcrafted with Bacardi peach rum, sweet tea vodka, freshly squeezed lemonade and slices of fresh peach, priced at $13. Partiers will nurse away their hangovers with signature breakfast selections including the croissant French toast, a freshly-baked croissant classically prepared into French toast, topped with warm maple syrup, fresh berries, powdered sugar and whipped cream, priced at $10.95; and the breakfast quesadilla, a combination of scrambled eggs, bacon, avocado, pico de gallo and cheddar and jack cheese served in a flour tortilla, priced at $11.95. Guests may also indulge in Cabo Wabo’s bottomless mimosas and Bellinis, priced at $24.99; as well as a selection of specialty breakfast beverages. Cabo Wabo’s breakfast selections are available daily from 8 to 11 a.m.